Nathive is a libre software image editor, similar to Adobe Photoshop, Corel Photo-Paint or GIMP, but focused on usability, logic and providing a smooth learning curve for everyone. The project runs in the GNOME desktop environment and anyone is welcome to collaborate on it with code, translations or ideas. This project is in beta phase, so it is an incomplete work, unfit for the end user yet. Until now the development was focused in laying down the application core and create easy dev tools, so for now we will focus on create new plugins, because there are obvious lacks yet. The intention is to achieve a professional image editor progressively without giving up initial usability. 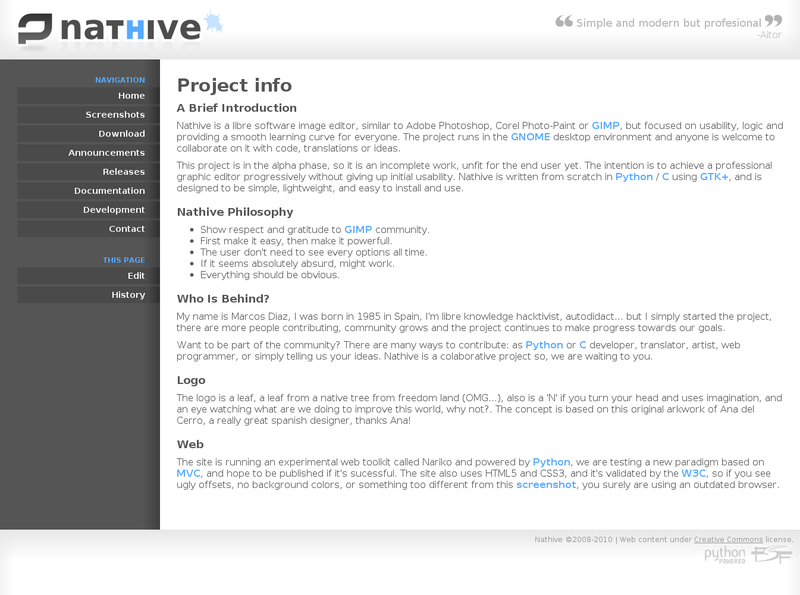 Nathive is written from scratch in Python using GTK+, and is designed to be simple, lightweight, and easy to install and use. Show respect and gratitude to GIMP community. First make it easy, then make it powerfull. The user don't need to see every options all time. If it seems absolutely absurd, might work. My name is Marcos Diaz, I was born in 1985 in Spain, I'm a libre knowledge hacktivist, autodidact... but I simply started the project, there are more people contributing, community grows and the project continues to make progress towards our goals. Want to be part of the community? There are many ways to contribute: as Python developer, translator, documentation writer, artist, web programmer, or simply telling us your ideas. Nathive is a colaborative project so, we are waiting to you. The logo is a leaf, a leaf from a native tree from freedom land (OMG...), also is a 'N' if you turn your head and uses imagination, and an eye watching what are we doing to improve this world, why not?. The concept is based on this original arkwork of Ana del Cerro, a really great spanish designer, thanks Ana! The site is running an experimental web toolkit called Nariko and powered by Python, we are testing a new paradigm based on MVC, and hope to be published if it's sucessful. The site also uses HTML5 and CSS3, and it's validated by the W3C, so if you see ugly offsets, no background colors, or something too different from this screenshot, you surely are using an outdated browser.